Iowans who work in downtown Des Moines have been lamenting the flight of retail from its streets several decades ago, leaving them with precious little to do, and nary a place to eat, during breaks in their nine-to-five shift. With a population that’s been hovering around 200,000 for more than 50 years, it seems doubtful at this point that there will be a surge of life back into the downtown. But there’s an upside to that: I was able to enjoy a refreshingly unhurried pace without distractions and admire some pretty nice buildings without crowds crashing into me whenever I stopped. These are my favorites. 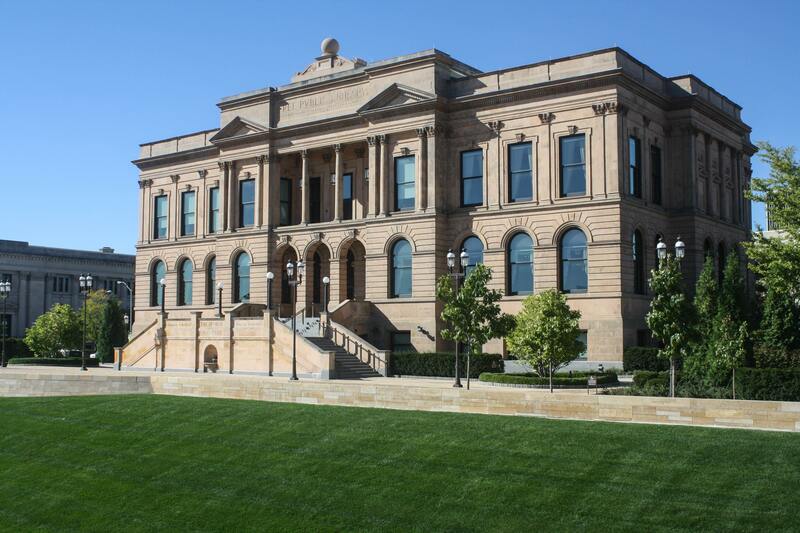 One of the most magnificent state capitols in the United States, the Iowa State Capitol sits on some generous sloping acreage with unobstructed views between it and downtown, just over a mile away on the other side of the Des Moines River. Dominated by the 23-karat gold-leaf-covered central dome, 275 feet above the ground, and with additional domes at each of its four corners, it’s the only five-domed capitol in the country. Completed in 1886 as the city’s tallest building, a title it would hold for about 40 years, the capitol features a dignified façade of limestone, granite, and sandstone, and a luxurious interior furnished with 29 types of marble. As soon as I entered, I began to meet some very friendly Iowans, starting with a 10-minute conversation with the two security guards. The secretary in the Governor’s Reception Room stopped her work to show me around; another staff member in the Secretary of State’s office did the same, highlighting the original Iowa Constitution, signed in 1857. On the first floor, I embarked on a 90-minute self-guided tour punctuated by lots of exclamations of “Wow!” Stepping directly under the massive rotunda, I spied the eight lunette paintings depicting the “Progress of Civilization”; the dozen statues representing such fields as law, history, commerce, peace, and literature; and the emblem of the Grand Army of the Republic suspended across the dome. Everything was bathed in a golden glow — the regal Grand Stairway, the massive mural Westward, the colorful tile floor, the six glass tile mosaics symbolizing things like charities and the three branches of government, the elaborately carved festoons, and the painting of an overflowing basket of corn titled Plenty, the centerpiece of the Iowa Exhibit at the Pan-Pacific Exposition in San Francisco in 1915. The impressive chambers of the House of Representatives and the Senate continue the building’s grandeur, ultimately punctuated by the astoundingly beautiful five-story Law Library, with circular staircases of iron grillwork, skylights, and more than 100,000 books. Terrace Hill, the over-the-top historic governor’s mansion, began life in 1869 as the $400,000 home to Iowa’s first millionaire, Benjamin Franklin Allen. 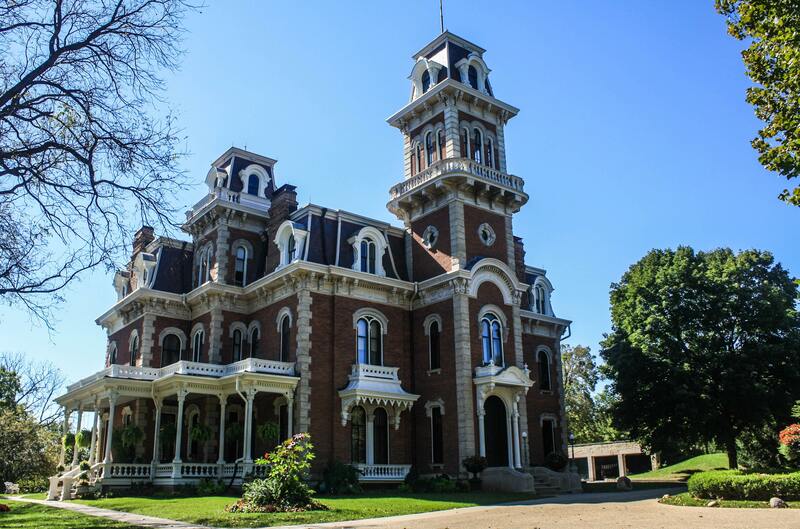 Shortly after he built this “Castle Among Cornrows,” Allen went bankrupt and sold the mansion for a measly $60,000 to the Hubbell family, who remained its residents for about a century until they donated it to the state for use as the governor’s home. This Second Empire confection was declared a National Historic Landmark in 2003 and is everything your Halloween story may look like. You could almost see the sheeted ghost blowing around the top of the 90-foot-tall central tower, passing by the paired windows of the steeply-pitched mansard roof, or loitering on the open verandas. Inside, past the 200-pound doors, it’s not so spooky, at least during the day. Built with modern conveniences for its time (hot and cold running water, an elevator, indoor restrooms, and gas lights), the interior impresses with a grand staircase leading up to a magnificent stained-glass window. The library and the well-appointed music, drawing, dining, and living rooms epitomize the refined tastes of the time. Currently closed for a full-scale renovation, the historic Hotel Fort Des Moines boasts an impressive register over the years. 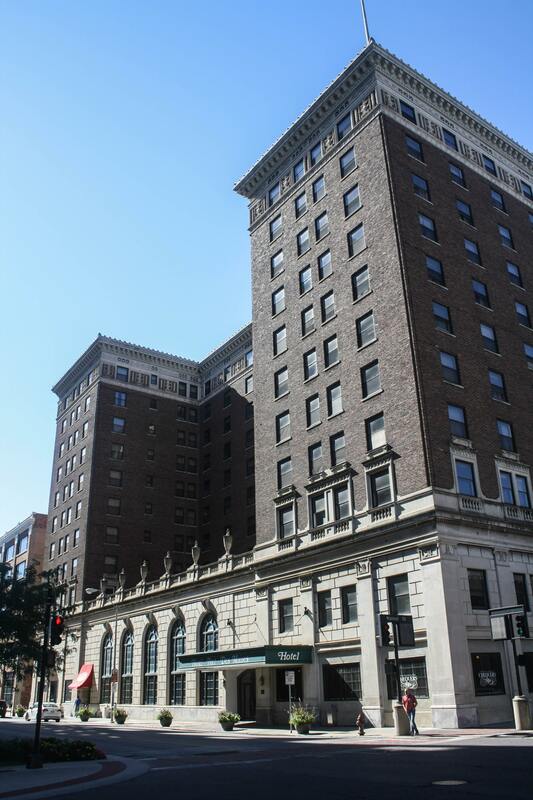 Developed after local business leaders decided to pool their money to create a marquee hotel downtown, the hotel opened in 1919. Since then, it has checked in the likes of Charles Lindbergh, Jack Dempsey, Mae West, Elizabeth Taylor, Nikita Khrushchev, Ozzy Osbourne, Elvis Presley, Jon Bon Jovi, and Cher, and at least 13 U.S. presidents, including Woodrow Wilson, Harry S. Truman, John F. Kennedy, Richard Nixon, Bill Clinton, and Barack Obama. The 11-story mostly brick building features a detailed cornice and covered urns atop a balustrade over the entrance. I particularly enjoyed the winged gargoyles staring down at me from the roofline. 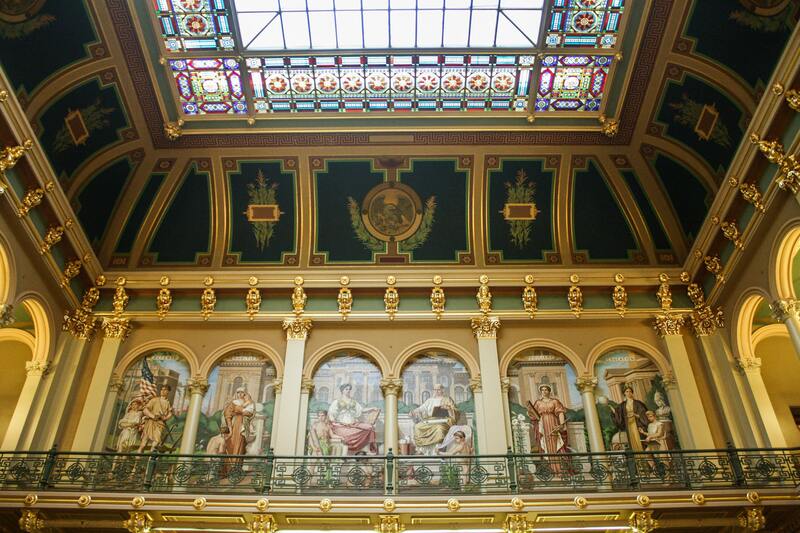 Hopefully, once the remodeling and titivation is complete, this hotel, with its interior marble staircase and walnut woodwork, will reclaim its reputation as one of the city’s most elegant places to stay. The salmon-pink limestone Beaux Art building of the Public Library has enjoyed a prominent setting along the Des Moines River since it opened in 1903 — an attractive welcome as I crossed the river and began to explore the city’s downtown. A double staircase leads up to a three-arched entrance, under the small balcony above it. The library secured a place in history in 1938 as the birthplace of the Library Bill of Rights, the American Library Association’s declaration regarding the rights of library users to intellectual freedom and of the responsibilities of libraries to support those rights. Listed on the National Register of Historic Places in 1977, the building ceased to be used as a library in 2006. After the library moved out, The World Food Prize moved in, and it has been that organization’s Hall of Laureates ever since. 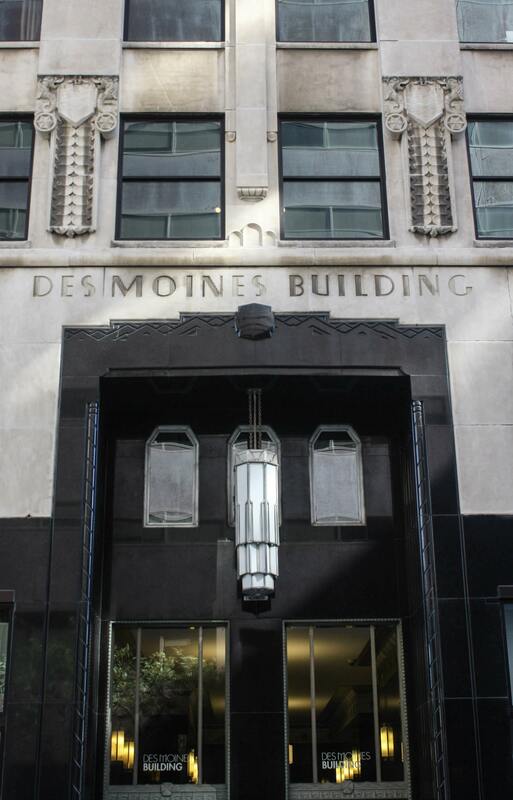 The eye-catching 14-story Des Moines Building is one of the city’s few examples of Art Deco architecture. Completed in 1931 with a marble and masonry façade, the 190-foot-tall structure began life as an office building, featuring classic Art Deco motifs, fonts, lighting fixtures, and stylized ears of corn. Upper-floor setbacks give it a distinctive profile in the Des Moines skyline. Eventually abandoned and then declared a public nuisance in 2011, the building was purchased the same year for a measly $150,000 and has been converted into apartments. Listed on the National Register of Historic Places in 2013, the Des Moines Building, including a 360-degree rooftop lounge that boasts some impressive views, does a fine job of representing the city it’s named for.